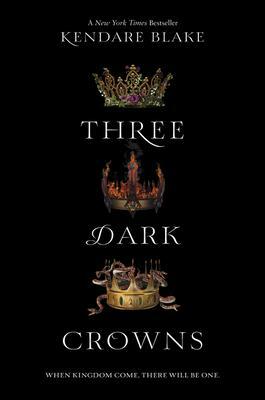 Fans of acclaimed author Kendare Blake's Anna Dressed in Blood will devour Three Dark Crowns, the first book in a dark and inventive fantasy series about three sisters who must fight to the death to become queen. But becoming the Queen Crowned isn't solely a matter of royal birth. Each sister has to fight for it. And it's not just a game of win or lose...it's life or death. The night the sisters turn sixteen, the battle begins. The last queen standing gets the crown. Three queens, all equal heirs to the crown and each possessor of a coveted magic. Mirabella is an elemental, able to spark hungry flames or vicious storms at the snap of her fingers. Katharine is a poisoner, one who can ingest the deadliest poisons without so much as a stomachache. Arsinoe, a naturalist, is said to have the ability to bloom the reddest rose and control the fiercest of lions. But becoming the Queen Crowned isn't solely a matter of royal birth. Each sister has to fight for it. And it's not just a game of win or lose . . . it's life or death. The night the sisters turn sixteen, the battle begins. The last queen standing gets the crown.